228 pages | 40 B/W Illus. Project planning is generally accepted as an important contributor to project success. However, is there research that affirms the positive impact of project planning and gives guidance on how much effort should be spent on planning? To answer these questions, this book looks at current literature and new research of this under-studied area of project management. The author presents his findings from an extensive review of project planning literature that covers more than 270 sources. He also discusses new research that analyzes data from more than 1,300 global projects. The book confirms that the time spent on planning activities reduces risk and significantly increases the chances of project success. 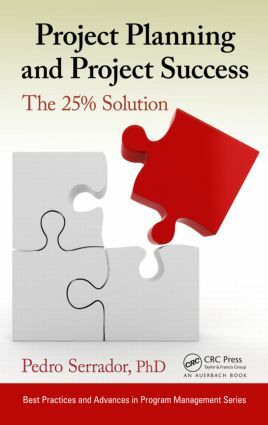 It also concludes that there can be too much planning and shows that the optimum ratio of planning to effort is 25%. The book examines the impact of project planning on different industries. It discusses research in the construction and information technology (IT) industries, and presents a case study of how to plan and track a software development project. The book also looks at the impact of geography on project planning and success. Intended as a basic tool in the library of any project manager or general manager, this book brings to light project planning techniques and information that have never been published previously. It is an important resource on how to plan projects properly and propel your career forward. "While careful planning can reduce risk and increase the success, excessive planning can hinder timely completion of a project. Pedro Serrador considers nearly 300 project planning sources and concludes that spending 25% of the time allocated to a project on planning results is an optimal level of timely success. He then considers this model in terms of real life project planning including construction and information technology examples. This book will be a useful resource for any project manager or general manager. Also included are supplemental checklists and forms that can help to optimize the planning of projects to benefit customers, stakeholders and companies." "Project Planning and Project Success looks at current literature and new research of this under-studied area of project management. … Intended as a basic tool in the library of project managers and general managers, Project Planning and Project Success brings to light project planning techniques and information that have never been published previously. It is an important resource on how to plan projects properly and propel careers forward." Project Success and Planning: What Are They? Estimate Right the First Time! What Is the Optimum Planning Phase Time? Pedro Serrador, PMP, ITIL, P.Eng., MBA, PhD is a senior project/program manager with more than 20 years of experience. He is a teacher, writer, speaker, and researcher on project management topics. His specialties are studying aspects of project success and managing technically complex and high risk project consulting engagements. He holds an Hons. BSc in Physics and Computer Science from the University of Waterloo, Canada and an MBA from Heriot-Watt University, Edinburgh, Scotland. He is an accredited professional engineer in computer engineering and has been a PMP since 2000. He holds a PhD in Strategy, Programme & Project Management at SKEMA Business School (Ecole Supérieure de Commerce de Lille).